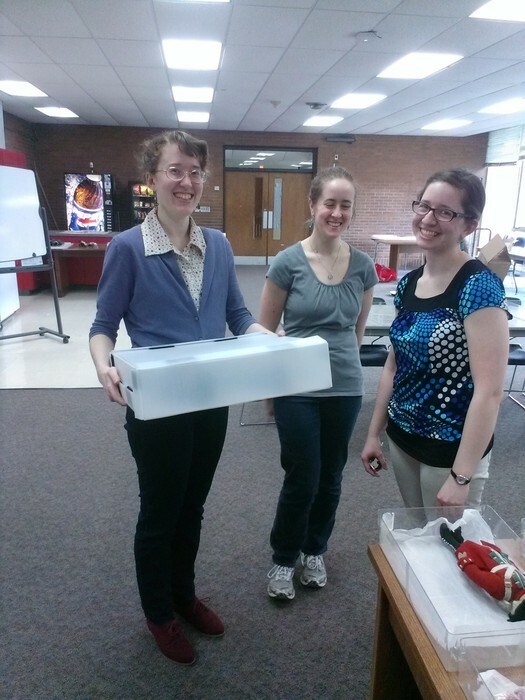 The staff and volunteers of the Indiana Deaf History Museum have had a busy year! We are working hard on making changes to improve our ability to create exciting new exhibits, and meet the highest standards of preserving our archives and artifacts. Our mission is to instill pride in our identity as Deaf Hoosiers, and educate all communities about Deaf history. We are excited to launch our e-newsletter that will be produced quarterly, and will contain news about the museum, research projects, ISD student projects, historic photos, and articles about topics of Deaf History. This past summer, the board of directors of Indiana Deaf Heritage (IDH) appointed Kris Johnson as the new museum director. 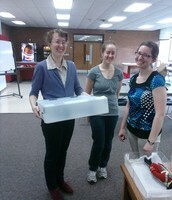 Kris started as a volunteer in September 2011 when she moved to Indianapolis from Connecticut. 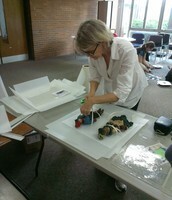 She relocated to attend IUPUI as a graduate student in the Museum Studies program. 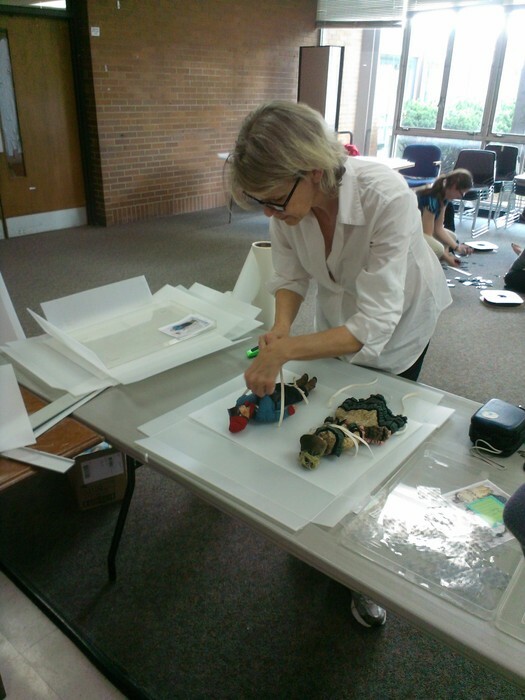 Kris completed her degree in May of 2013, and has coordinated several projects with other IUPUI students and faculty. 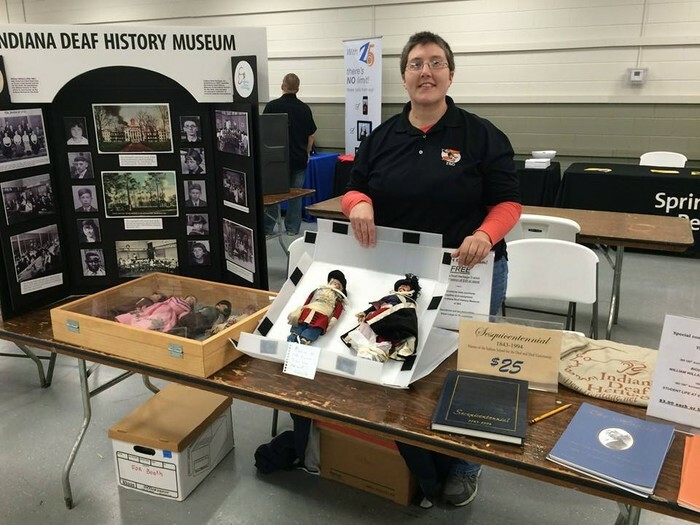 Kris now works full-time at ISD, and her new duties as museum director will be to catalogue the archive and artifacts in our collection, work with ISD teachers and students to set up Deaf history research projects, and develop new displays and exhibits. She is looking forward to exciting new projects in 2015! For many years, ISD alumnus Jerry Cooper served as both the museum director and the president of IDH. Jerry stepped down as museum director to focus on his duties as president of the IDH board, but he will still be involved in researching and designing exhibits, plus promoting the museum at Deaf community events. 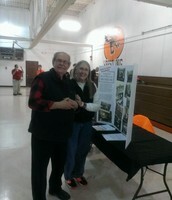 Thank you, Jerry, for your dedication to ISD and preserving the history of Deaf Hoosiers! 1. 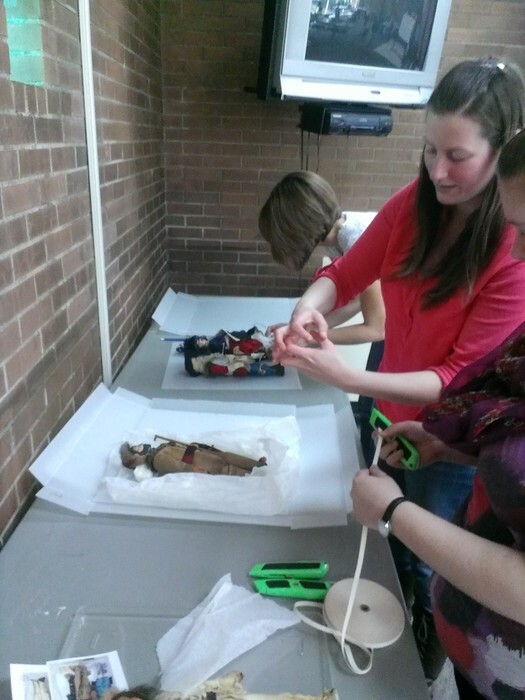 Preventative Conservation: Students focused on collections care designed and built new storage boxes for our collection of hand-made dolls from the 1930s. ISD and IDH shared the cost of purchasing museum quality storage materials to build the new boxes that will protect the dolls from dust and light damage. 2. Museum Administration: Three groups of students from this class did an in-depth analysis of Indiana Deaf Heritage, and prepared strategic plans for improving our efforts for managing the museum, fundraising, and recruiting volunteers. 3. 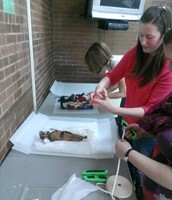 Museum Education: Five students from this class chose to develop educational programs about different ASL topics. These programs will be posted online for public school teachers and homeschool parents to use for teaching their students and children about ASL and Deaf Culture. Since it's not always convenient for people to visit our museum, we've decided to take the museum out into the community. 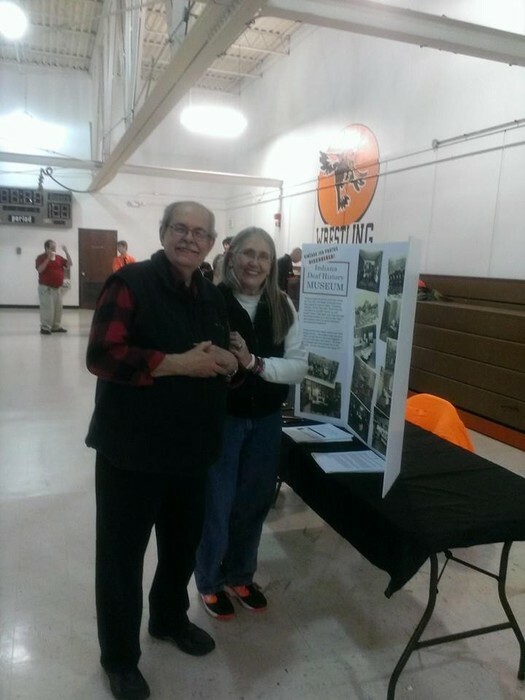 In 2014, we created ISD history displays and set up booths at different Deaf community events! We were very happy to be invited to the ISD Alumni event on Saturday before PTCO Day, and we talked with many alumni who were thrilled to reminisce about school history. In October, we drove to Crowne Point, IN for the Northwest Indiana Deaf Festival. Almost 50 people visited our booth! 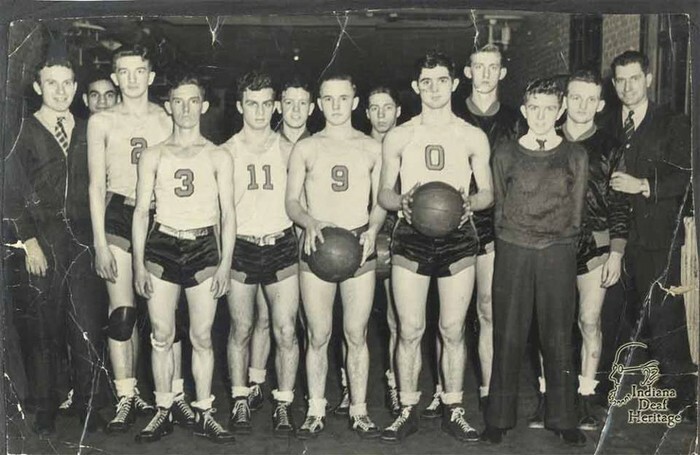 Recently, we displayed newly discovered ISD photos from 1922 at our basketball homecoming game. The photos were found for sale on eBay! 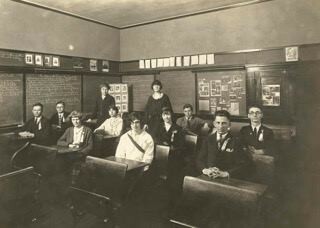 The Indiana Deaf History Museum is located in Alumni Hall of the Indiana School for the Deaf. 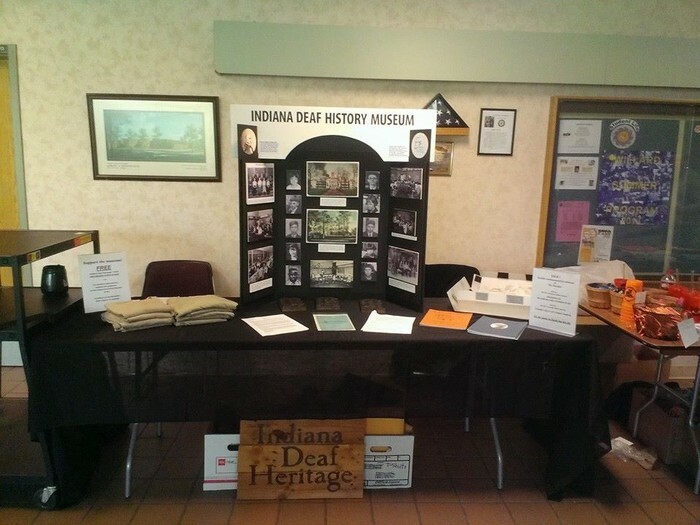 ISD is partners with Indiana Deaf Heritage, a non-profit group that was established for the purpose of preserving ISD archives and developing exhibits about Deaf history in Indiana.